Delaware County 4-H is celebrating 100 years of service and connecting youth to hands-on experiences that teach kids how to succeed in life. The Delaware County Board of Commissioners honored the 4-H clubs with a proclamation during its Thursday session, Feb. 28. Pictured, left to right, back row: Jon Melvin, Commissioner Jeff Benton, Commissioner Barb Lewis, Cheryl Hagerty, Commissioner Gary Merrell, Harold Wolford, Walter Morton, Ralph Jordan and Bob Irvin; front row: Kathy Blevins, Julie Riley, Michael Riley, Allison Riley, Laryssa Hook, Lauren Van Gundy and Donna Morton. 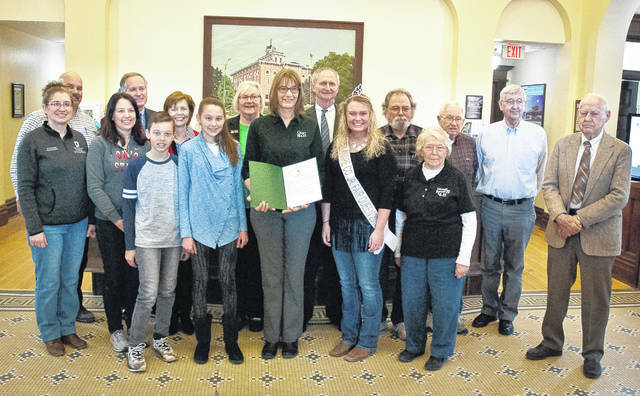 The Delaware County Board of Commissioners honored Delaware County 4-H clubs with a proclamation Thursday (Feb. 28) for 100 years of service in connecting youth with hands-on education. Delaware County OSU Extension 4-H Youth Development Educator Laryssa Hook said the first club was started 100 years ago with 20 boys from around Delaware County who learned to raise and show purebred hogs. Since that time, she said, 4-H has expanded the hands-on education beyond the scope of agriculture to include science, arts, technology, and many other topics. According to the 4-H website, the programs build the skills of responsibility, resiliency and hard work, helping kids to succeed in life. When Hook asked for alumni to stand, many of the county leaders in attendance at the commissioners’ meeting stood, indicating they were involved in 4-H during their younger years. Michael Frommer, county administrator, said he was a veteran of the Hancock County 4-H. He originally wanted to join the Boy Scouts of America but his parents told him the 4-H program would be a better fit for him. Frommer began his employment with the county as the director of the Regional Sewer District before being elevated to county administrator. Sarah Dinovo, assistant clerk and administrative assistant to the Delaware County Board of Commissioners, said her 4-H days as a youth were spent in Morrow County. Dinovo said she didn’t do any of the projects involving the raising and caring of animals because she didn’t grow up on a farm. She said her club did the other things 4-H offered. Jon Melvin, facilities director, said he grew up participating in 4-H and continues to volunteer in the program. Melvin said when he met his wife, she was a horse person. Walter Morton, of Galena, said he has worked with 4-H youth for over 35 years. He said that he and his wife are involved with the international exchange program, finding families to host teens from Japan. “We hosted one for two years, and she even graduated Big Walnut High School,” he said. Hook said that the 4-H clubs across Delaware County are enrolling new members, ages 5-9, March 1 through April 15. The deadline to enroll is April 15. The 4-H clubs held two open houses from 2:30 to 4:30 p.m. on Sunday, March 3: Berkshire Township Hall, 1454 Rome Corners Road, Galena; and Delaware County Extension office, 149 N. Sandusky St., Delaware. For more information about joining a 4-H club, visit www.delaware.osu.edu or call the Delaware County Extension office at 740-833-2030.